It’s safe to say that CD Projekt Red’s Cyberpunk 2077 is the most highly anticipated game in development right now. The upcoming title from the team behind The Witcher 3 has game aficionados around the globe in its grip, despite not showing even a second of gameplay footage. It’s been kept tightly under wraps after the backlash from The Witcher 3’s overtly ambitious early showings. CD Projekt Red is showing a lengthy gameplay demo to the press though. Earlier this summer, journalists at E3 got to see the hour long demonstration, which was available to selected visitors of Gamescom this week. The only difference between the two demos was the option to play as a male character, but surprisingly our room full of stereotypical game writers weren’t interested in playing as a dude. It struck me as weird that a game set in 2077 only has the option for two genders. But maybe that’s not surprising for a studio that tweets embarrassing jokes about gender politics and then follows it up with a weak non-apology apology. At its core, Cyberpunk 2077 is an open world, first person role-playing game, set in a huge dystopian metropolis called Night City in the ‘Free State of California’. You play a character called V, who you can customise a little bit in terms of looks. Not that that really matters in a first person game, but hey it’s nice to have options. Our demo started off halfway through a mission where V and two of her buddies had to save a person from a band of scavengers, who kidnapped said person to harvest her cyber implants. Gameplay-wise it was pretty straight forward, you go into an apartment, take a drug that lets you move around in bullet time, shoot some fools, save the victim, jack a USB cable in her neck to read her vital signs, call the ambulance helicopter, and send her off to the hospital. The ambulance helicopter introduced an interesting concept; according to the developer it was part of an insurance scheme only available to the ultra rich. Cyberpunk (the genre) goes hand in hand with political commentary, and this was the first reference of that in the game. Unfortunately, it was also one of the only ones. To be fair, we didn’t get to see a lot of lore and exposition, but I am slightly worried that Cyberpunk 2077 might not be cyberpunk enough. CD Projekt have stated that the game is going to be ‘inherently political‘. This is comforting, but it wasn’t really showing in the hour long demo I saw. What Cyberpunk 2077 lacks in the social commentary department, it makes up for in gameplay. After the first slightly generic mission we got a good taste of how much freedom the game offers in terms of player agency. Like any other open world RPG you’re free to pick whichever quest you want to go on, but Cyberpunk 2077 offers an impressive amount of freedom on top of that. We saw a bunch of tense confrontations that could be solved in non-violent ways by talking your way out of them. The best example of said freedom came towards the end of the demo. V was on a mission to retrieve an expensive spider drone, only to get held up at gunpoint before reaching the merchant. V struck a deal with her assailant and somehow ended up with a payment chip with enough money to buy the drone on it. The chip however, was infected with a virus. When V finally makes it to the merchant, she is posed with the option to let the sellers know about the virus. In our demo the player chose not to tell, which caused the chip to send out a static shock disabling a couple of nearby gang members and aggravating the rest. With the gang turning hostile, V’s only option was to shoot her way out of the meat factory she was now trapped in, showing us some of the game’s more advanced combat mechanics. The guns in Cyberpunk 2077 are very cool. We saw a handgun with ricocheting bullets, allowing you to shoot around corners. We also saw an SMG equipped with homing bullets, a shotgun that could should through cover, and even a katana with an electro-magnetic shield to block bullets. Every single gun looked badass and amazingly fun to play around with. We also got a glimpse of the game’s stealth options. At one point in the demo the player did a silent takedown on a random thug and then got the option to hack into his brain. This allows you to see his memories so you can get a map with all the nearby enemies on them, which you can then hack as well. This, in turn, lets you disable their guns, resulting in hilarious situations. Don’t ask me how this all works – it just does and it’s rad. The whole quest had me wondering how the player choices affected the outcome mission. What if we shot our way out of the robbery? And what if we told the merchant’s the chip was infected? The impact could be minor, there were definitely ways it would’ve played out similarly with alternative choices, but the implications were fascinating. 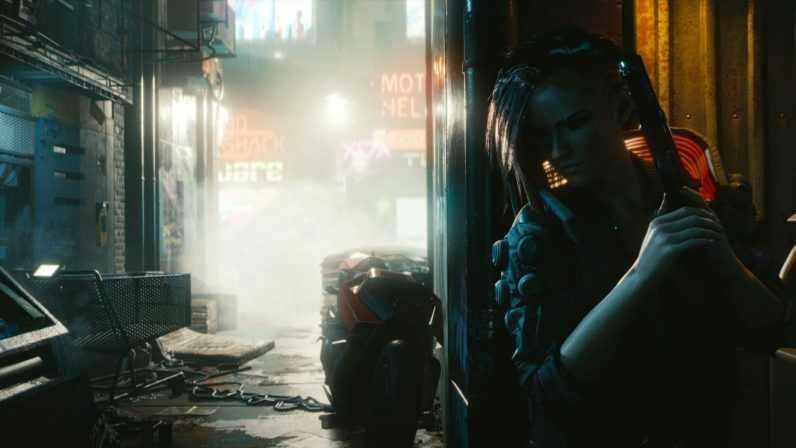 Cyberpunk 2077 is still a ways off — the developer hasn’t said anything about a release date and it could very well be that we don’t see the final product until 2020. I’m curious to see how the whole thing pans out, and sure it will be all good in the gameplay and graphics departments. I just hope the story bits hold up their end of the bargain. And it would be nice if CD Projekt Red could keep the offensive jokes about gender politics to themselves in the meantime.